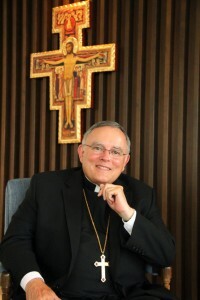 Archbishop Charles J. Chaput, O.F.M.Cap. Archbishop Charles J. Chaput, O.F.M.Cap., successfully underwent knee replacement surgery Tuesday, Dec. 4. In the following statement released Dec. 7, he responds to the many expressions of prayerful support he received in the days before and since the surgery. I’ve heard from many, many people across the Archdiocese and beyond over the past few days with prayers, Mass intentions and good wishes for the outcome of my knee surgery. I’m very grateful. I’m home now, and while there’s plenty of predictable discomfort, the surgery was a complete success. My surgeon said it was the worst-looking knee he had seen all year; in fact, he was surprised I could walk at all! So the operation should make a big difference in my ability to get around and do the work of the Church we all share in the coming year. Again, God bless all of you for your kindness and concern, and may our celebration of Christmas this year be a source of joy for all our families. I am so happy to hear this, Your Grace. I’ve been praying specially for two bishops this month: you and Bishop Morlino. May God give you both many blessings! I am so happy with your very good outcome, Archbishop! At OLGC School, we stormed Heaven with our prayers on your behalf and the students cheered when they heard your surgery was a success! I’m so glad you’re home and are beginning the rehab which I know will be “uncomfortable” to say the least. However, take courage! My late mother underwent two knee replacements at 69 and at 78 and both rehabs were very successful. God love you and keep you safe, Archbishop!